To make a syrup, place 85g golden caster sugar; 300ml water; zest and juice of 1 lime; 2.5cm piece cinnamon stick; 2 pieces star anise and 2tbsp syrup from jar of stem ginger in a small pan, and simmer for 5-10 minutes to reduce slightly. Strain the syrup and leave to cool. 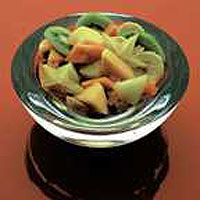 Place the prepared fruit in a large serving dish. We used 1 ready-to-eat mango, peeled and diced; 1 carambola (star fruit), washed and thinly sliced; 1 kiwi fruit, peeled and thinly sliced; 1 papaya, peeled, deseeded and diced; ½ Galia melon, diced; 2 small bananas, peeled and sliced and 1 piece of stem ginger, finely chopped (optional). Pour the cooled syrup over the top. Serve with crème fraîche with a little finely chopped stem ginger stirred through. The fruits and quantities can be varied according to what's available and your own taste. This recipe was first published in February 1999.